We can’t always predict the future, but we can plan for it. Bringing your pensions together into a Fidelity SIPP can help you take control of your retirement savings and get your money working harder. Before going ahead with a pension transfer, we strongly recommend that you undertake a full comparison of the benefits, charges and features offered. Please read our pension transfer factsheet. This information is not a personal recommendation for any particular product, service or course of action. If you’re in any doubt about whether a pension transfer is suitable for your circumstances we strongly suggest that you seek advice from an authorised financial adviser. A Self-Invested Personal Pension (SIPP) is a flexible, tax-efficient way to save for your retirement. Learn more about the benefits of bringing your pensions together in a SIPP. Earn £20 to £1,000 cashback if you apply to transfer by 7 June 2019. 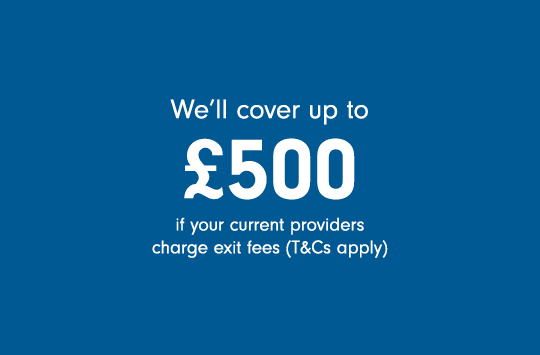 We’ll also cover up to £500 if your current providers charge exit fees (exclusions, T&Cs apply to both and can be found below). If you’re ready to transfer your pensions, you can transfer online, download an application form or call 0800 368 1722 to request a form by post. With our flexible low cost SIPP you choose what to invest in and when. Wide investment choice, so you have more ways to help your money to grow. Help choosing investments and ready-made solutions. Low service fee - typically just 0.35% (ongoing fund management charges apply). Additional benefits if you invest over £250,000, including an even lower fee of 0.2% and a Relationship Manager. Flexible income options at retirement with guidance and advice. Minimum value applies. Plus get £20 to £1,000 cashback if you apply to transfer by 7 June 2019. Exclusions, T&Cs apply. Receive £20 to £1,000 cashback if you apply to transfer your pensions, ISAs or other investments to us by 7 June 2019. We'll also cover up to £500 if your provider(s) charge exit fees ( T&Cs apply). The maximum cashback we'll pay is £1,000 but not all customers will receive this amount. The actual cashback you'll receive is dependent on the total value of your transfer. The minimum amount you must transfer to be eligible for cashback is £10,000. If you move your assets to another provider within 18 months of completing your transfer, Fidelity reserves the right to reclaim any payments which were made to you as part of this offer. If you transfer in cash, the provider you are transferring from will sell your investments and send the proceeds directly to us. We will hold them as cash within your account until you decide what you would like to invest in. Assets held in an existing Fidelity pension, including the Fidelity Personal Pension provided by Standard Life, the EBS SIPP and any defined contribution pension scheme held through Fidelity are not eligible for the cashback offer. This offer is valid for qualifying applications received between 15 March to 7 June 2019. The value of investments can go down as well as up, so you may not get back the amount you originally invest. You cannot normally access money in a SIPP until age 55. Company shares are not yet available for all Fidelity SIPP holders and are not eligible for this offer within a SIPP. Pension transfers can be complex and pensions with safeguarded benefits and advised transfers are not eligible for this offer. Please read our pension transfer factsheet, the cashback T&Cs and exit fees T&Cs. It’s important to understand that pension transfers are a complex area and may not be suitable for everyone. Before going ahead with a pension transfer, we strongly recommend that you undertake a full comparison of the benefits, charges and features offered. If you’re in any doubt about whether a pension transfer is suitable for your circumstances we strongly suggest that you seek advice from an authorised financial adviser. Please note that if your pensions are moved to us as cash, you will be out of the market while your money is being transferred, so you could miss out on growth and income if the market rises during this time. If you transfer investments that are not supported by Fidelity, they will be sold and moved to us as cash, which means that you will be out of the market until you choose new investments. If your existing pension provider has signed up to an industry accepted paperless transfer service your transfer should be completed in about 10 business days. If not, the transfer could take 8 to 10 weeks but could be longer as the process is reliant on prompt action by your existing providers whose time frames can be variable. If you’d like to discuss transferring a pension or would like us to send you an application form. To find out what you need to consider before you transfer, please read the factsheet. Whether you already have a SIPP with Fidelity or not, download the relevant application form, fill it in and return it to the address on the form. Start your ISA transfer in just a few simple steps. Transferring investments to us has never been easier. Need more time to decide if transferring is right for you? Leave your name and email address through the link below and we’ll notify you when our next SIPP cashback offer begins. When we receive your transfer application we’ll send you a confirmation, then contact your providers to arrange for your investments (or cash) to be brought into your Fidelity account. Please be aware that you may be out of the market while the transfer takes place, so you could miss out on any growth or income that occurs while we complete your request. Before you apply to transfer a pension you’ve taken retirement benefits from, you must speak to Fidelity’s Retirement Service. They’ll discuss the transfer with you and prepare the application form. How long does it take to transfer my pension? Defined benefit schemes (for example final salary pension schemes). Please read the next question regarding advice requirements for this type of pension. Can I transfer a pension with guarantees to Fidelity? A pension that contains any kind of promise or guarantee requires careful consideration. This is because such benefits are normally lost once you transfer and cannot usually be reinstated. The value of some benefits can be substantial and a transfer, giving them up, may prove to be both costly and inappropriate. We may, at our discretion, accept a transfer from a pension that contains such benefits, provided that our requirements have been met. Generally, for transfers containing safeguarded benefits, we will require confirmation that you have received appropriate financial advice and that the advice confirmed it was in your best interests to transfer. Without this, the transfer to us cannot proceed. See ‘What are safeguarded benefits?’ further down the page for more information about these. For transfers containing other benefits we will need you to provide confirmation that you are aware of the benefit you will be giving up by transferring but that you still wish to proceed. See ‘What are other benefits?’ further down the page for more information about these. For more information on your options and to discuss what we may need from you in order for the transfer to proceed, you can contact us on 0800 368 1722. If you are unsure about the type of pension you currently hold and what benefits are available to you, contact the provider of the pension. We believe that it is essential that you receive financial advice in order to make an informed decision. These generally offer a guaranteed level of income at retirement or provide a promise about the rate of secure pension income that may be obtained from your pension pot at a future date, typically upon retirement. They are typically found in older policies and are often valuable today as many were written at a time when interest rates were much higher and people weren’t living as long. With lower interest rates and higher life-expectancy, the guaranteed income from these plans is often much better than you could buy if you shopped around. These pay a retirement income based on your salary and how long you’ve worked for your employer. They are generally only available from public sector or older workplace pension schemes. This is a valuable guaranteed income sometimes offered by your own pension scheme or provider if you take a lifetime annuity with them. A GAR is likely to provide a higher guaranteed income than would normally be available on the open market. If you have a GMP or RST, you originally built up pension rights in an employer’s scheme that was contracted out of the Additional State Pension. When this happened the new scheme had to promise to provide you with a pension broadly equivalent to the state pension you would have received under the Additional State Pension. You may not be able to take these benefits early unless the pension pot is already large enough to cover the cost of providing the pension. Similarly, you may not be able to transfer a pension containing GMP or RST to another scheme unless the transfer value also covers the cost of providing the GMP or RST. When you transfer a pension containing GMP or RST to another pension scheme, that scheme has no obligation to provide benefits on the same basis. The lists above are not exhaustive and you should research the benefits available to you within your existing pension before you request a transfer. These generally do not provide guarantees of future income at retirement but may still be valuable. With-profits bonuses (if you are invested in a with-profits fund, you may benefit from annual and terminal/maturity bonuses depending on the underlying investment performance. You should consider how a transfer and the timing of it will impact the payment of those bonuses). The above list is not exhaustive and you should research the benefits available to you within your existing pension before you request a transfer. What should I do if I still want to proceed with transferring my pension? For a low-cost, fixed fee, our specialists at Fidelity’s Retirement Service can give you personal advice about transferring your pension. Call us on 0800 084 5045 to discuss your needs. We’ll base our recommendation on careful analysis of the value of your transfer in relation to your personal circumstances and goals. If your pension contains ‘other benefits’ but you still want to proceed with transferring your pension you can complete and return the Confirmation of benefits form to us so we can process your request. For free, independent and impartial information and guidance on workplace and personal pension matters you can visit www.pensionsadvisoryservice.org.uk. The promoter of this offer is Financial Administration Services Limited (“Fidelity”), 130 Tonbridge Road, Hildenborough, Tonbridge, Kent TN11 9DZ. Subject to section 5, the Offer is available to anyone who completes a transfer of their assets from other providers to Fidelity Personal Investing. To transfer assets you must submit a correctly completed form online or by paper. Cashback will be paid in the amounts noted in the table in section 9. If you transfer less than £10,000 you will not receive any cashback. The minimum transfer value is £1,000 unless the transfer is from another provider and you’re immediately going to start taking money from it, then the minimum is £50,000. Cash transfer within ISAs and pension products – If you transfer in cash within ISAs and pensions, the provider you are transferring from will sell your investments and send the proceeds directly to us. We will hold them as cash within your account until you decide what you would like to invest in. Re-registration – this involves a change to the fund or share register to show that Fidelity has taken over the administration of your investment/s. We can re-register your investments if the same investments are available through our Investment Platform, and they are able to be re-registered*. If you hold a particular share class of an investment that we do not offer, we will sell your investment after we re-register it and move the proceeds into a share class that is available on Investment Platform. This switch can take up to two business days, and your money will not be invested during this time. If you hold an investment that is not available through our Investment Platform or is otherwise unable to be re-registered* it will only be able to be moved to us as a cash transfer (see above), If the cash transfer is not within a pension or ISA, that amount will not count toward your total for the Offer. A re-registration does not count as a “disposal” for capital gains tax purposes, even if we switch your investment into a different share class. Please note that the minimum SIPP re-registration value is £1,000. * Re-registration is not available for some products on the Fidelity Investment Platform. For example, a number of offshore funds cannot be re-registered. You should also note that Company shares are not yet available for all Fidelity SIPP holders and are not eligible for this offer within a SIPP. Please note that this does not affect Investment Trusts within a SIPP which are eligible for the cashback offer. Nor does it affect the re-registration of company shares in a Fidelity ISA or Investment Account, which are eligible for cashback and available to all new and existing customers. the lodgement of certified shares. The Offer will also not apply to assets that are currently held in a product/account provided or administered by any company within Fidelity’s group of companies which are transferred to another provider and then moved to Fidelity Personal Investing. Any other new investment will not qualify for the Offer. Any transferred assets will be subject to the applicable client terms for the product your assets have been transferred to. The value of your cashback payment will be determined by the total value of your eligible transferred assets on completion of the final transfer, as set out in the table below. Cashback payments will be sent to you after the closure of the Offer (7 June 2019) and up to 90 days after the completion of your last eligible transfer. We may open a Cash Management Account (CMA) on your behalf to enable us to facilitate this payment to you. The CMA is a separate account in your name that helps manage cash, currently for the purpose of paying cashback to you. This cash account will appear on your account summary online. We will endeavour to make cashback payments by BACS transfer directly to your bank/building society account if we already hold your details. If we do not have bank details registered for you for the SIPP, a cheque will be sent to the address registered on your account. The time it takes to complete a transfer will depend on your current provider(s). The money will be due to you at the point we issue payment. The assets you move to us as part of this Offer must be held with us for at least 18 months after the completion of the transfer and must not be linked to an adviser during this period. The 18-month period starts on the date that the last transfer is settled on your account. If you transfer or re-register your assets to another provider within this 18-month period, Fidelity reserves the right to reclaim any cashback payment that was made to you as part of this Offer. Fidelity may do this by withholding an amount prior to transferring or re-registering your assets to another provider. We will not reclaim the cashback amount from assets within a SIPP, other pension or ISA. Withdrawals from your account/s or income payment will not count as transfers for the purposes of this condition and will not result in our reclaiming your cashback payment. We promote pension transfer cashback offers on a regular basis. However it is important that you take enough time to decide whether transferring your pension to us is right for you. If you need more time and wish to qualify for the cashback offer, please wait until the next offer period. Issued by Financial Administration Services Limited, which is authorised and regulated in the UK by the Financial Conduct Authority. Fidelity, Fidelity International, the Fidelity International logo and the F symbol are trademarks of FIL Limited. If you want to transfer into a SIPP you already have with Fidellity, download this application form, fill it in and send it to us at the address on the form. If you want to open a SIPP with Fidelity and transfer into it, download this application form, fill it in and send it to us at the address on the form. The combined value of all pensions being transferred must be at least £1,000 and you can transfer up to 10 pensions at a time. If you don't have a SIPP with Fidelity we will take you through opening one. If you already have a Fidelity account, log in here to transfer into your SIPP or to open one. If you need to open a SIPP to transfer into, you can do that here.